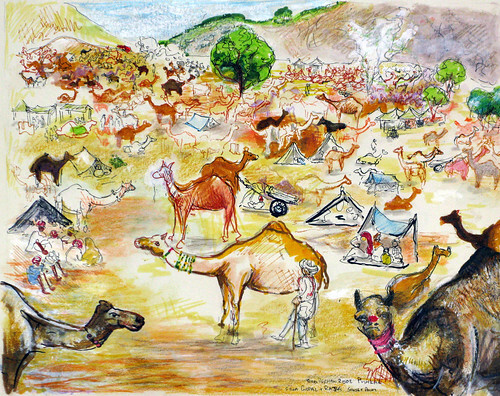 The chaos and noise of the crowd overwhelms everything we’ve come to see at the Pushkar Camel Festival, even the camels – and there are a lot of camels. Taxi camels loiter in the shade as their touts tries to land customers. Decorated camels – lavishly covered in multicolored pom-poms, bells, mirrors, and fringe – wait for their turn in one of the many camel contests. Behind the fairgrounds, thousands of camels fart, spit, grunt, and bide their time until a buyer takes them home. In the main fairgrounds, a camel dance contest is underway. Over the heads of the crowd that’s equal parts foreign and Indian tourists, I catch glimpses of a camel’s neck twisting and arching. Sadly, the camel is feeling the beat, not the rhythm, dancing in response to strikes by its trainer, not in time to the music. Coins jingle in the bottom of brass alms buckets carried by orange clad, pot-bellied sadhus. Unintelligible contest announcements blast from bullhorns strung above the stands. Whiny Indian flutes and staccato drums provide the camel dance soundtrack. Sand scrapes against stone under hundreds of pairs of flip flops as the crowd mills about the fairground. Overwhelmed and overheated, Todd and I push through the crowd to the exit. We hike towards a distant building that stands alone in the dunes, where we know we can get a cold drink and a quiet(er) view of a landscape made mostly of camels.